We got our Christmas tree! It has been snowing, snowing, snowing here but we ventured out and got our tree! :-) I am so proud of how into Christmas Khalid is getting considering he hasn't been celebrating it very long.... My poor little car still hasn't made here yet with my Christmas decorations, but we used string and paper snowflakes to make our tree look festive. We also used a date night to go down to the Rathaus (Town Hall) to their big Christmas Market where we purschased our first ornament together. :-) It was freezing, but it was exciting to see the city all lit up and Christmasy. They were having a big Coca-Cola party as well, so it was packed. And I am probably the only one in Vienna who was craving ice cream, but I also got a wonderful coffe haselnut eis to celebrate. Ha! Yea! for Jesus being born so we could have a cool holiday and a place in heaven! GIGATTATGIG! You two look so HAPPY - guess that's because you are! I am happy for you to be TOGETHER! 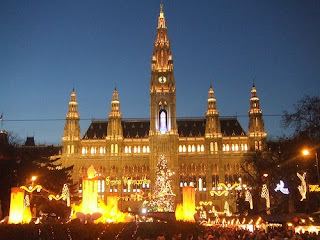 Austria appears to be a romantic spot at Christmas time. Be sure to share your pictures! Praise God that you can share a Christmas together in a beautiful place!